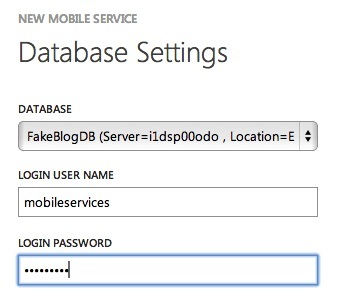 With all the excitement over Windows Azure Mobile Services, one of the questions we get frequently is how to connect Mobile Services to an existing database. It turns out that this isn’t very hard to do but may require some changes to your database. Today I’ll walk you through taking a database hosted locally in SQL Server, pushing into Windows Azure SQL Database, and connecting it using a Mobile Service. If you’d like the quick explanation with out all the pretty pictures and moving from a local DB to Windows Azure, you can check out Paul Batum’s answer on the MSDN forums (I didn’t find this until after I had figured out all of the below). In order to use Mobile Services, you’ll need a Windows Azure account. You can sign up for a free trial here. While in preview, Mobile Services stay free even when the 3 month trial of the other features of Windows Azure expires. Let’s start by loading our local database and looking at the changes necessary. You can follow along by creating our sample database on your own server. You can use this script to do so. This database is meant to store the data for a blog website. Specifically, it has a table to store Users and a table to store entries. It’s a very simple database but it will suffice for what we want to do. 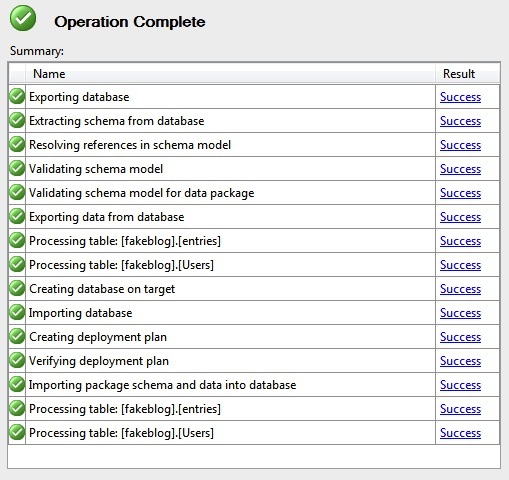 One thing to point out is that you’ll need to have CREATE SCHEMA permissions for this to work. With that done, there is one more change we need to make to both tables. If you look at the tables, you’ll see that both of them have a column named “id”. Now our DB is ready to be ported to Windows Azure SQL Database. When you do that, the first thing that happens is the server checks your IP address to see if it’s on the list of IPs that are allowed. You’ll see two popups show up at the bottom of the screen to add your current IP, go ahead and click yes on each. Once you’ve done that, you’ll be able to connect to your SQL Database server from your local SQL Server Management Studio client. 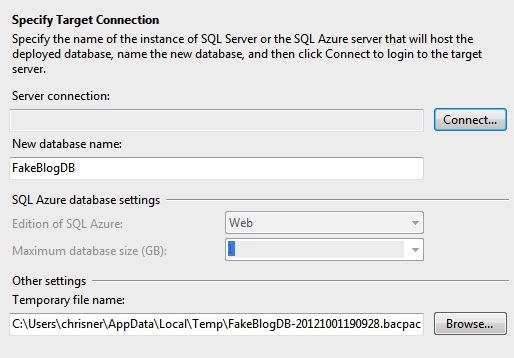 Go back to the Deploy Database to SQL Azure wizard and connect to the server (you can click a link to view the credentials in the same screen in the portal). When you tap through, you should see the operation start and after a few seconds it should complete. Now you can access your database from anything connected to mobile services. Today we saw that it isn’t that difficult to put an existing database into a Mobile Service. This can also be done if you already had a database in SQL Database as well as long as you keep in mind the changes necessary for a table to work with Mobile Services (the id column and the schema). Additionally, not every data type is supported in Mobile Services at this time. For example as we saw when uploading images into Mobile Services, binary data types don’t currently work. For more information on the supported data types, take a look at the CUD section of this article on Dinesh’s website. 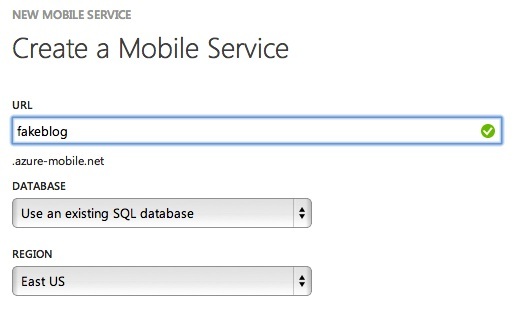 Quite informative article on how to connect Mobile Services to an existing database! Windows Azure Mobile Services provide backend solutions and accelerate client applications development. However, integration of Windows Azure with other cloud-based solutions such as GroupDocs has proved valuable return for users of both platforms. You can go through the blog below for further details. Thanks for this post. I had totally missed the part about the id column. Had to go through some renames to get my existing tables since, of course, I named it TableId. Figures. Happy to help. Yeah, using an existing DB can be a little tricky. Awesome! This is exactly what i have been looking for! thanks! Hey, thanks for this awesome tutorial. I have successfully executed all the steps. But the problem is after i have done this my scripts that i write with the table are not working(no logs are being listed). Can you please help? Thanks in advance. Sorry to hear that Saad. Are you sure you're hitting the REST API for the table? Are you actually getting data back when you hit them but the scripts aren't running or is nothing working? I would first make sure you're able to hit the table. I would then put a "console.log('test');" statement at the beginning of the request and check the Logging tab in the portal to see if it's being hit. This helped a lot in porting an existing database over. Thanks! 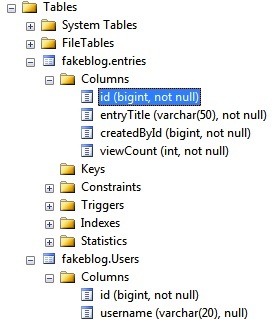 Where is it documented that a database has to have a column of name "id"? A team member keeps asking for a documentation. Happy this helped. I'm not sure it's properly documented everywhere YET but the assumption today is that you are creating tables and performing CRUD through your Mobile Service which will automatically add the iD column (which is now a String). Once there is a better story around importing / connecting to existing databases (what this article describes isn't exactly "turn key"), the ID column should be better documented. I want to ask is it possible to use Azure Mobile App back-end services with an instance of SQL Server which is not hosted in Azure ? I have my own servers and SQL Server but I want my Mobile Services to be hosted on Azure to take advantage of the offline sync ? Actually I was able to do that only by changing the connection string. The case is that our users can use different databases. I think of something like a table with client codes and connections strings. And on login dynamically to decide which connection string to use (for the different databases). Do you think that this will work for us ? Using a Hybrid connection will be safer than just exposing your on-premises SQL Server to the world for what it's worth. Out of the box Azure Mobile Apps doesn't really support switching connection strings on demand. You could build this out but you'd need to extend the server side SDK you're using.